The Grinch that Stole Christmas Tickets on Sale Now! You can read the story of how the Grinch stole Christmas to your children as you tuck them into bed—or you can take them to see the play live on stage. After all, hearing about the mean ole Grinch and all of his antics is one thing, but when you see him on stage trying to take Christmas away from the Who’s is an entirely different thing. How the Grinch Stole Christmas originally made its debut in Minneapolis in 1996, and got a rough start with a theatre strike, a court order, and a special arrangement with the family of the beloved Theodore Dr. Seuss Geisel. The great news is that How the Grinch Stole Christmas is live this year, and coming to a town or city near you. But don’t be left with an empty stocking this year because How the Grinch Stole Christmas tickets always sell out quickly. In fact, they’re going quickly even as you read this article! The most loved off all Christmas plays started out this year on December 4 in San Diego. Then it alternates between there, Boston, Massachusetts, and Schenectady, New York, St. Louis, Missouri, Philidelphia, Pennsylvania, and Madison Square Garden in New York City. The show runs until December 30, 2018. The reviews for the classic play are glowing. Many people talk about seeing their children or grandchildren clapping and smiling the entire play, except as one reviewer put it, when the Grinch acts scary. Other reviewers say the actor who plays the Grinch is fabulous in his part, funny, and completely convincing. Overall the people who have reviewed The Grinch Who Stole Christmas loved it and are very happy they spend the money to see the show. At TheatreTicketBank, we offer first rate seats to How the Grinch Stole Christmas and all other theater events so you can have one reliable source to find all of your tickets from. What’s more, we make it our mission to keep you up to date about everything that is going on in the theatre world. We do that maintaining a blog that informs you about the latest shows and events, and anything you need to know to stay current on theatre happenings. We also keep our fans updated on our social media channels. For instance, you can like us on Facebook, follow us on Twitter, and join us on our Google+ account. Nothing gets you in the Christmas spirit more than a lavishly decorated stage, and Christmas theatre events are some of the most elaborately appointed shows during the year. But if you’re like many people, you’ve already seen the traditional Christmas plays like The Nutcracker, A Christmas Carole, and if you have children, How the Grinch Stole Christmas. But just because you have seen the classics, that doesn’t mean you have to miss the theatre this year. Producers have gotten creative with performances, and this year’s Christmas shows are a testament to that. Here are three Christmas holiday theatre events you don’t want to miss. If you live in New York City—or if you plan to visit during the holidays, the Radio City Christmas Spectacular held at the Radio City Music Hall from December 14 thru the 19 is one show you don’t want to miss. Santa Claus himself MCs the event, and while the show has been in production since 1933, this year’s show and Rockettes are built on diversity, so it will be a historic performance. If you’re looking for a magical set, talented singers, and more Christmas carols than you can count, the Broadway Christmas Wonderland may be just the show for you. This performance is for both adult and children alike, and many people who have seen it declare that they plan to see it again before it’s gone. The show starts December 14 in Colorado Springs, and travels across the country until finally wrapping up in Wichita, Kansas on December 22. This musical is based on the 1954 film of the same name. The story is uplifting as it follows two song and dance stars who, with romance in mind, follow two beautiful singing singers who are headed toward their Christmas gig in Vermont. The Irving Berlin’s White Christmas show kicks off December 14 in San Francisco, California, and alternates between there and Saint Paul, Minnesota, finally ending up the tour in San Francisco on December 23. The classics are heartwarming and comforting during the holidays, but if you want to step out of the box this year, why not see one of the events listed above? Or better yet, take in a classic and a new play. 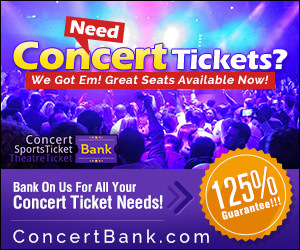 In addition to having the tickets you want, we also keep you current on all the latest happenings in the music world. We maintain a concert ticket blog that informs readers about the latest news, gossip, and concert happenings, and we update it regularly. In addition, we keep our fans informed by staying current with all of our social media accounts. Check out our Facebook account, Twitter Feed, and our Google+ pages when you want to know what’s happening with your favorite group. And remember, if you want the best seats for a Christmas show this year—traditional or out of the box, you can get them on our website, or call us at 844-425-0512. In 2007, a little known Indie Film named “Waitress,” quickly developed a cult-like following. And then the writer, director, and supporting star of the film, Adrienne Shelly, was tragically murdered in her New York City home by a construction worker who worked in the building. Ironically, the film’s theme was about resilience and new beginnings. But the show goes on. A musical adaptation of the film has hit Broadway with a running start, and judging from the audience’s reactions to it, it’s going to have a long run. 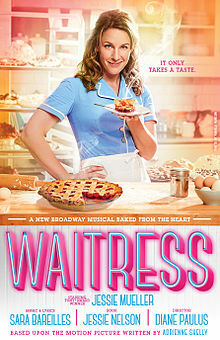 Buy Great Seats to Waitress Here! A long standing tradition at the Broadway box office is the millionaire’s club. Shows get to join it when they reach one million in sales, and just last week, Waitress ticket sales reached the golden mark. In addition, Waitress made history recently as the first Broadway musical to fill the top creative spots with women—four spots in all. And it’s no wonder. The show boasts an all-star cast of behind the scenes talent. Diane Paulus, who also directed Pippin, directs it, writer Jessie Nelson of I Am Sam is involved, Lorin Latarro of Movin’ Out, choreographed it, and Sara Bareilles wrote the music and lyrics for the show. Can Pie Pull You Out of the Dumps? The plot of the play is fairly simple, but according to critics, the richness of Mueller’s performance and the roles of the secondary characters give this play all the charm and whimsy necessary to make it a hit. Jenna is married to an abusive husband who waits for her to get off work every day so he can take the money she earned in tips. She befriends two other waitresses at the diner, a salty opinionated one and a naïve one, and they commiserate with each other’s lots in life. Their boss and cook is a gruffy man who also adds humor and interest to the storyline. Jenna has a talent for baking pies that are so good, they’ve made her a local celebrity. She uses whatever mood she’s in at the time, which can vary wildly, to name the famous pies. But when Jenna discovers she’s pregnant, she’s suddenly no longer content to live with the abuser. So she uses her magical gift of baking pies to enter a contest that has a grand prize of $20,000. In her mind, she’ll use the money to escape the torment of her personal life. If you’re looking for a lighthearted musical this summer that has a deep down hidden message of resilience, you can’t go wrong with Waitress. Although the music and script are light and at times funny, there are also poignant moments in the play that will appeal to those who like to walk away from a show with something to think about. For example, the boss of the diner sings a song that critics are calling deeply moving, and Mueller herself sings a song that brings some members of the audience to tears. In other words, this is truly one of those Broadway musicals that has something for everyone. As of this writing, we have a good selection of Waitress tickets, but as the tourists flood into New York City, we predict that shows will begin selling out quickly. In other words, if you want to see this year’s hottest musical, you should reserve your seats now. But we don’t only provide the best seats to all the shows you want to see. In addition, we make it our mission to keep you up to date about everything that is going on in the theatre world. We do that maintaining a blog that informs you about the latest shows and events, and anything you need to know to stay current on theatre happenings. We also keep our fans updated on our social media channels. For instance, you can like us on Facebook, follow us on Twitter, and join us on our Google+ account. And remember, if you want to buy Waitress tickets while they’re still available, you can get them on our website, or by calling 844-425-0512. 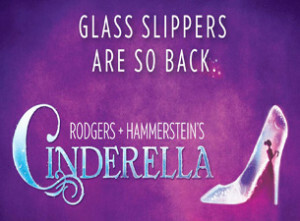 If you fondly remember Rodgers and Hammerstein’s Cinderella as a sugary musical television production with Lesley Ann Warren performing in the title role, the updated version of the show for Broadway may just give you a little jolt. All your favorites are still there – Impossible things happen every day, and Cinderella still sits in her own little corner on her own little stool – but being whatever she wants to be has taken a decidedly modern turn. The Broadway production that’s now touring the country (currently in Los Angeles, and moving to San Francisco at the start of May) ironically owes its updated story to the writer’s decision to unearth the original version of the fairy tale, written in 1697. Check Out Our Inventory of Cinderella Tickets Now! Rodgers and Hammerstein wrote the original production of Cinderella for television. It first aired in 1957, starring a 21-year-old Julie Andrews in the title role. The version most familiar to today’s parents and grandparents, starring Lesley Anne Warren, aired in 1965 and became an annual tradition for many families. Hammerstein’s intent was to expand the book and produce the show on Broadway, but he died before that happened. Since then, various versions of the play have cropped up on stages around the country – and on television – but it took a confluence of circumstances to fulfill Hammerstein’s dream of bringing Cinderella to Broadway in 2013, and it almost didn’t happen at all. As playwright Douglas Carter Beane, who wrote the book for Broadway’s Cinderella, tells the story, his first instinct was to turn down the chance to update Cinderella for modern Broadway audiences. Like many who grew up with the versions made in the 1950s and 1960s, his impression of Cinderella was that it was a “someday my prince will come” story, where the heroine is rescued from a life of drudgery by a handsome prince and a healthy sprinkling of fairy godmother magic. He was curious enough to look at the original production, though, and then to seek out the original Charles Perrault fairy tale on which it was based. What he found was a whole other story that had been left out of modern retellings entirely. The version of Cinderella that debuted on Broadway in 2013 is a story with a message. Rather than it being the tale of a beautiful but poor young girl who is swept away by a handsome prince, it’s the tale of two lost people who find each other, and in doing so, find themselves as well. Underlying nuances that are only hinted at in the Rodgers and Hammerstein book find their way to center stage in the Broadway production. In the 1965 television, show, for example, the king and queen have a brief conversation about their brooding son, but it’s never quite clear why he’s in no hurry to marry. Beane gives all of the characters more depth, and reinstates the original moral of the story – how Cinderella wins over the prince and the entire court, not with her beauty, but with her kindness and charm. If you’ve sworn off Cinderella stories because you think it teaches bad lessons about waiting for Prince Charming, the Broadway Cinderella production will make you fall in love with the magical fairy tale all over again. This is not your grandmother’s Cinderella. She’s so much stronger and more resilient, which makes her all the more lovable. At TheatreTicketBank, we offer first rate seats to all the theater events you want to see, including Cinderella. 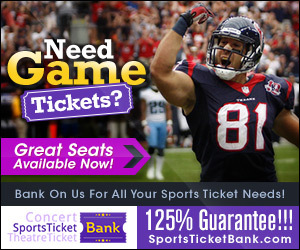 Isn’t it good to know that you have one reliable source to find all of your tickets? What’s more, we make it our mission to keep you up to date about everything that is going on in the theatre world. We do that maintaining a blog that informs you about the latest shows and events, and anything you need to know to stay current on theatre happenings. We also keep our fans updated on our social media channels. For instance, you can like us on Facebook, follow us on Twitter, and join us on our Google+ account. And remember, if you want the best seats for Cinderella, you can get them on our website, or call us at 844-425-0512. Grab Your Lion Kings Tickets While You Can! While most of the show is performed in English, the actors speak six different indigenous African languages at various points in the show. They include Swahili, Zulu, Xhosa, Sotho, Tswana, and Congolese. The animal costumes in The Lion King are part of what make the show so magical and engaging. Many of them are big – but none of them come close to the giraffes, seen in “I Just Can’t Wait to Be King.” They tower over the rest of the animals and actors at a staggering 18 feet tall. Julie Taymor, who won the Tony Award for Best Direction of Musical for The Lion King in 1998 was the first woman to win a Tony in that category. In fact, the actors represent 25 different species of animals, fish, birds and insects in The Lion King. Some of the animals include lions (of course! ), hornbills, warthogs, meerkats, hyenas and wildebeest. 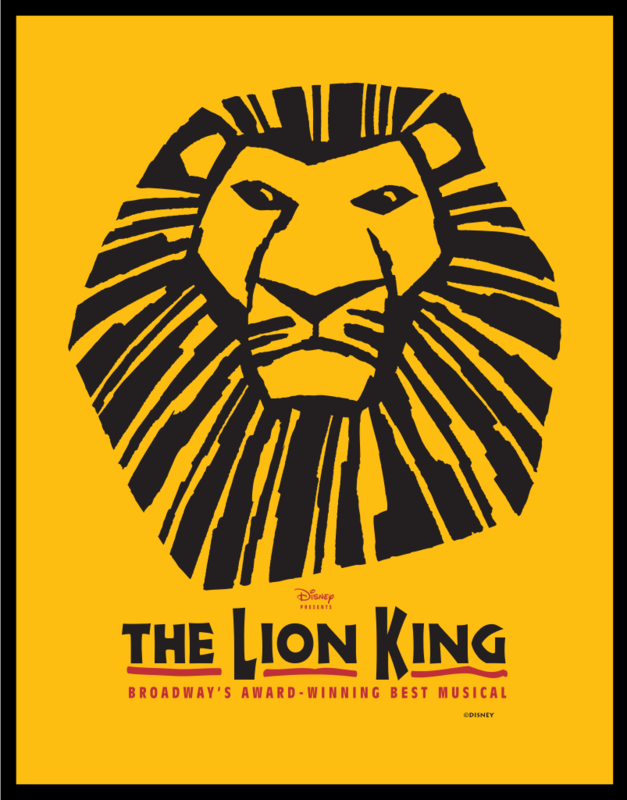 For teachers who want to use a trip to Broadway as a learning experience, Disney has put together a 40-page study guide to The Lion King. It includes facts about the environment and history that relate to The Lion King’s setting. It defines unfamiliar terms (great for vocabulary lessons), suggests theatrical and other educational activities, and even manages to discuss apartheid in terms that are simple enough for most children to understand. In fact, if you really want to impress, you can download the study guide (it’s free!) and drop truth bombs on your companions before and after the show. 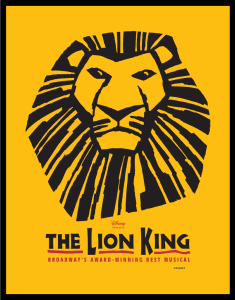 At TheatreTicketBank, we offer first rate seats to The Lion King and all other theater events so you can have one reliable source to find all of your tickets from. What’s more, we make it our mission to keep you up to date about everything that is going on in the theatre world. We do that maintaining a blog that informs you about the latest shows and events, and anything you need to know to stay current on theatre happenings. We also keep our fans updated on our social media channels. For instance, you can like us on Facebook, follow us on Twitter, and join us on our Google+ account. And remember, if you want the best seats for The Lion King, be sure to get them on our website, or call 844-425-0512.
Who doesn’t know that Mr. Grinch is a mean one? The story of the mean old miser whose heart grows three sizes when he learns the true meaning of Christmas is a holiday tradition in many families – but few get the chance to see the Broadway production live on stage. The show, which originated in Minneapolis in 1996, has a storied history that involves a strike of theater support workers, a special court order and a special arrangement with the family of Theodore “Dr. Seuss” Geisel – and if it’s playing in a city near you this year, you’d better grab Grinch tickets quickly, because it probably won’t be back for a long, long while. Get How the Grinch Stole Christmas Tickets Before They Disappear! This year, the show kicks off its limited engagement tour in the Big Easy. It will be the first time families in New Orleans have a chance to see the classic kids’ story come to life on stage, and tickets are very limited, thanks to the theater’s policy of releasing tickets first to its subscribers. If history holds true, it will be years before the Broadway touring company returns to New Orleans, or any of the other cities on this year’s itinerary. How the Grinch Stole Christmas has been touring since 2010. The run usually consists of 5 to 10 cities, and only one city has hosted the musical more than once. It played Chicago in 2012 and 2014. In 1994, the Children’s Theatre Company of Minneapolis debuted an original production of the classic animated Christmas special, thanks to a special arrangement with the estate of Theodore Geisel, better known to generations of kids and parents as Dr. Seuss. The play ran again in 1995 and 1998, always to sold out houses. In 1998, the Old Globe Theatre in San Diego mounted a production of The Grinch, and has repeated it every year since. 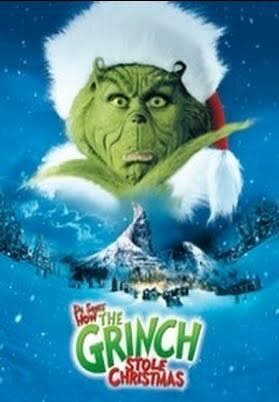 The Grinch musical didn’t come to Broadway until 2006, but when it did, it made a smashing debut. With critical raves of the production, audiences packed the Foxwoods Theatre for a historical 12 shows per week. In the second week of December 2006, the Broadway production of How the Grinch Stole Christmas The Musical achieved something no other show had managed for nearly two years. It knocked “Wicked” out of first place in the weekly top earners chart, breaking a 100-week streak of that show as Broadway’s biggest earner. The show made history again in 2007, when its second Broadway run ran into problems when the stagehands’ union, Local One, went on strike against a number of Broadway theaters. The strike prevented the show from opening on schedule despite a separate contract negotiation. When the theater owner locked out the stagehands and the company in sympathy with the striking workers, the Grinch producers went to court and got an injunction forcing them to reopen, much to the delight of audience members who had How the Grinch Stole Christmas tickets. The show played out its entire run despite the theater owners’ Grinch-like behavior. How the Grinch Stole Christmas features all of your favorite songs from the animated Christmas special, plus a few more that were written specifically for the stage production. It’s a must-see holiday spectacular, and with Grinch tickets in such high demand, this is the time to lock yours in if you want to give your kids a special holiday treat they’ll never forget. At TheatreTicketBank, we offer first rate seats to How the Grinch Stole Christmas, and all other theater events so you can have one reliable source to find all of your tickets from. What’s more, we make it our mission to keep you up to date about everything that is going on in the theatre world. We do that maintaining a blog that informs you about the latest shows and events, and anything you need to know to stay current on theatre happenings. We also keep our fans updated on our social media channels. For instance, you can like us on Facebook, follow us on Twitter, and join us on our Google+ account. Don’t forget, these tickets will go quickly, so if you want to surprise your kids with one of the most beloved Christmas shows, be sure to get your tickets before we sell out! Motown the Musical is About – What Else? – The Music! As “Motown the Musical” – the slick Broadway jukebox show authored by none other than Motown founder Berry Gordy – makes its way across the country on its national tour, theater reviewers have been almost universally laudatory. That’s almost, not unanimously. Here and there, you’ll find a few reviewers noting that the show is “thin on story.” Maybe they thought Gordy would spill deep, dark, behind the scenes secrets of his rise from featherweight boxer to heavyweight music producer, and ultimately, one of the most powerful men in the music industry. That was never Gordy’s style, though. Motown was all about the music and the show – and so, too is the theater spectacular he’s put together with producers Kevin McCollum and Doug Morris. 70 Motown Hits in 3 Hours – Get Your Motown Tickets Now! And what a show! “Motown the Musical” manages to pack nearly 70 Motown hits into just under three hours on the stage, all the while weaving the story of Gordy and the stars he discovered, groomed and ultimately lost as they moved on to their own projects. All the big names are represented – and lovingly portrayed: Smokey Robinson, Diana Ross, Marvin Gaye, Stevie Wonder, The Temptations… the list goes on and on. Even the harshest critics note that the actors portraying the stars are about as authentic as they come. But the real story is about the music, and “Motown the Musical” really delivers on that promise. These aren’t just a jumble of songs – they represent the best of Motown’s catalogue, including megahits like Marvin Gaye’s “What’s Going On” and The Marvelletes’ “Please Mr. Postman,” medleys of the Jackson Five’s greatest hits, Smokey Robinson and Stevie Wonder’s super hits – it’s like a Motown party that goes on and on and on. That’s not to say that the performances are lacking in anything, either. Charl Brown was nominated for a Tony for his performance of Smokey Robinson on Broadway, and he recreates the role to perfection in the touring company. Luci St. Louis plays a flawless Diana Ross, and has the audience eating out of her hand with her rendition of the dynamic diva. Thirteen-year-old Kwame Kandekore charms the audience as an appropriately energetic young Michael Jackson – his previous role was in the London production of “The Bodyguard,” where he shared the role of the star’s son, Fletcher, with six other 10-year-old boys. The show’s star, though, is undoubtedly Cedric Neal, whose Berry Gordy is sensitive, touching and very, very personal. Well, not really. The real star of “Motown the Musical” is the music, which has the audience tapping toes, nodding their heads, and singing along with the lyrics that they all know so well. “Motown the Musical” is playing a series of 2-5 day runs in select theaters across the country through the end of the year. Many of the venues sell out quickly, especially in cities with an active theater scene. 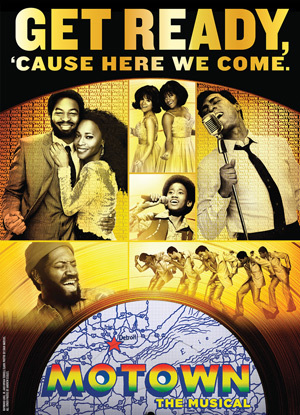 Check our listings to find out when the show will be in your neck of the woods and get your “Motown the Musical” tickets before they sell out. Not only can you find the best seating for Motown the Musical on our site, but you’ll find excellent seating choices for all the productions you want to see. And in addition to having the tickets you want, we also keep you current on all the latest happenings in the theatre world. We make it our mission to keep you up to date about everything that is going on in the theatre world. We do that maintaining a blog that informs you about the latest shows and events, and anything you need to know to stay current on theatre happenings. We also keep our fans updated on our social media channels. For instance, you can like us on Facebook, follow us on Twitter, and join us on our Google+ account. It only seems appropriate on International Women’s Day to pay tribute to the three amazing women who are bringing new life to one of Broadway’s most beloved classics, “The Sound of Music.” The Broadway revival cast is currently touring North America, playing in such renowned venues as the Boston Opera House, Philadelphia’s Academy of Music and Ontario’s National Arts Centre in the next few months. Find Premium Seats to the Sound of Music Here! Can an Old-Fashioned Play Bring it to Broadway. Yes! When The Sound of Music tour was announced last year, the news was greeted with a mix of wariness and anticipation. Broadway critics wondered whether director Jack O’Brien could breathe life into a show that was largely considered dated and old-fashioned. Those doubts were swept away as the show opened to rave reviews after its Los Angeles opening. While critics spoke glowingly of nearly all aspects of the production, their real praise was reserved for the trio of women playing major roles in the show. Anderson’s youth brings a sweetness and freshness to the meaty role that’s in keeping with the freshness of the production – and with the youth of another of the major players, Paige Silvester, who plays 16-year-old Liesl Von Trapp. Variety’s Bob Verini noted that for a change, Liesl actually does seem to be 16 going on 17 rather than 21 going on 30. Silvester brings a wealth of experience to her role – she’s toured nationally with “Evita,” among other things, and is the proud possessor of a BFA in Musical Theater from the University of Michigan – and she puts that experience to good use. Silvester’s Liesl has an emotional depth that’s largely missing in the more familiar 1965 movie role. In fact, the entire production has more emotional depth. O’Brien has stripped away the years of tradition surrounding the classic Broadway musical and rendered it according to the original book rather than trying to recreate the Hollywood silver screen production on stage. Under his direction, a much younger than expected Mother Superior, played by soprano powerhouse Ashley Brown, gently guides and counsels the young novice Maria as the girl deals with her own doubts and questions. 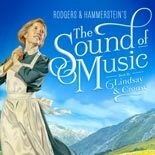 Brown’s soaring soprano rendition of Climb Every Mountain will stay with you long after the curtain comes down – as will the fresh look at the relationships and inner emotions of the main characters in this new, fresher version of The Sound of Music. Whether or not you’ve seen The Sound of Music on stage or screen, this particular production is a must-see. There are Sound of Music tickets available for nearly all upcoming shows, so there’s no excuse to miss it. And we have just the tickets you want. And not only do we sell premium tickets, we also keep you current on all the latest happenings in the music world. We maintain a blog that informs readers about the latest news, gossip, and concert happenings, and we update it regularly. In addition, we keep our fans informed by staying current with all of our social media accounts. Check out our Facebook account, Twitter Feed, and our Google+ pages when you want to know what’s happening with your favorite group. And remember, if you want the best seats for the Sound of Music, or any other production, you can get them on our website, or call 844-425-0512. Mary Bridget Davies, who won a Tony nomination for her portrayal of Janis Joplin on Broadway in 2013, has been “preparing for this role all my life,” Davies tells anyone who asks. The raspy-voiced singer has stunned audiences across the country with her uncanny resemblance to the powerhouse singer, not just in voice but in appearance and manner. While there may be a little secret sauce to her dead-on performance as Joplin – she’s distantly related to the rock and roll icon on her maternal grandmother’s side – most people who know Davies will tell you that there’s a whole lot more work and practice in the mix than the luck of birth. Davies grew up in a family surrounded by music, and started her own band, The Mary Bridget Davies Group, to play bars and venues in her native Cleveland. It was there that she caught the eye – and ear – of Sam Andrew, who founded the band Big Brother and the Holding Company. Janis Joplin’s first big successes came when she sang with Big Brother and the Holding Company back in 1967. Andrew invited Davies to sit in with the band on an international tour, and remembered her later when he was casting the national tour for another Joplin show, “Love, Janis.” Davies won the lead in “Love, Janis,” for which Andrew was the musical director. That was in 2005. Fast forward to 2011. Randy Johnson, writer and director of “A Night with Janis Joplin,” had mounted a regional tour of his production, starring singer Cat Stephani, with Davies as her understudy. In a story that seems pulled out of a Hollywood movie, Stephani backed out of the production during the show’s final preview, saying that she didn’t feel she had the full vocal range to do Joplin justice. With a day’s notice – and no rehearsal – Davies stepped into the role for opening night and gave it her all. 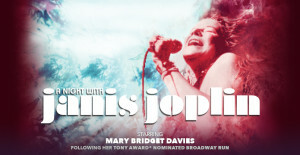 Now, just two years after the production closed on Broadway – and decided against an off-Broadway run – Davies is back in the role she was born to play, bringing Janis Joplin to stages across the United States and Canada. If you missed her during the show’s all-too-short run on Broadway, this is the perfect opportunity to grab “A Night with Janis Joplin” tickets and settle in for a night with… Janis Joplin. We have tickets to A Night With Janis Joplin and all the other great shows you want to see. But we don’t only sell tickets. We also keep you current on all the latest happenings in the music world. We maintain a concert ticket blog that informs readers about the latest news, gossip, and concert happenings, and we update it regularly. In addition, we keep our fans informed by staying current with all of our social media accounts. Check out our Facebook account, Twitter Feed, and our Google+ pages when you want to know what’s happening with your favorite group. And remember, if you want the best seats to see A Night With Janis Joplin, you can get them on our website, or call 844-425-0512. 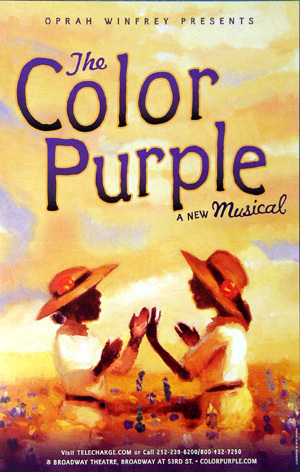 Way back in 1999, Broadway producer Scott Sanders optioned the rights to produce Alice Walker’s iconic novel, The Color Purple, which had already been translated to the big screen, as a Broadway play. It took five years for Sanders to get all the fiddly bits right, but on December 1, 2005, “The Color Purple” opened on Broadway for a wildly successful 3+-year run. Since the show hit Broadway, there has seldom been a month that it hasn’t been performed somewhere in the world. From 2007 through 2010, a series of casts took the show to Chicago, Los Angeles, North and South Carolina, Florida, Nevada and many more states and cities. In 2013, John Doyle mounted the first international production of the blockbuster play at the Menier Chocolate Factory in London to critical acclaim. Now, after 8 years away from the bright lights of Broadway, The Color Purple has come home, and the homecoming is spectacular. Purchase Tickets to See The Color Purple! Don’t take our word for it. The 2015 Broadway revival of The Color Purple, jointly produced by Scott Sanders, Roy Furman and Oprah Winfrey, opened in December at the Bernard Jacobs Theatre and the critics haven’t stopped talking about it since. The reviews from such widely diverse publications as the NY Times and Variety are packed with words like “red-hot knockout performance” and “beautiful beyond belief” and “a glory to behold.” Those aren’t just idle words and puff pieces, either. Those are reviews coming from some of the toughest, most jaded theater critics in the business. Now Broadway Records is upping the ante by releasing the official revival cast recording of The Color Purple’s musical numbers. The new record features all of the show’s most loved performances, performed by the revival cast members, which include Jennifer Hudson as the sultry Shug Avery, and Danielle Brooks, from “Orange is the New Black,” as the strong-willed Sofia. The real showstopper, though, is the performance turned in by Cynthia Erivo as Celie, the erstwhile heroine of the tale. Typically, when producers mount a revival of a popular show, critics are skeptical – and they take a lot of convincing to accept that the newly reimagined production is at least as good as the original show. The Menier Chocolate Factory production may have had a little boost in Broadway ticket sales when Oprah captured the excitement and whetted appetites with a primetime production of “Oprah Goes to Broadway: The Color Purple.” The show premiered December 19, and featured clips with the Broadway show’s stars, as well as an interview with Pulitzer Prize-winning author Alice Walker. Actors Danny Glover, Cicely Tyson, Phylicia Rashad and Lupita Nyong’o talked about the impact that the original film had on their lives and on their careers. 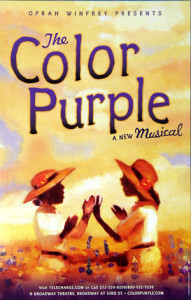 The special aired around the 30th anniversary of the 1985 film adaptation of The Color Purple, for which Oprah got an Oscar nomination, and just days before the show’s Broadway opening night. Whether you have fond memories of watching Oprah on the big screen or have never seen any adaptation of Alice Walker’s Pulitzer Prize novel, the current Broadway revival production of “The Color Purple” is a must-see. The show runs daily with weekend matinees, but many shows are already sold out. Our inventory of tickets changes frequently, so be sure to check with us for The Color Purple tickets before you make your plans.